Survey finds that how companies immediately react to public relations crises impacts their brand reputation in the long term. It’s been seven months since United Airlines experienced one of the biggest public relations (PR) blunders of 2017. The video footage of an airline official removing an unwilling passenger from a flight affected consumers, 53% of which said in a survey they would discontinue purchasing flights from United Airlines as a result. But what about now? Are consumers still scarred by the event, or have they, and the brand itself, recovered? To find out, we surveyed 500 more consumers to shed light on how people view United Airlines, Pepsi, and Uber seven months after their public fallouts. Is it possible that time can heal all wounds? Or, do certain events, and their ensuing message, cause permanent damage to a brand? 30% of consumers feel unsafe flying with United Airlines seven months after their PR crisis. Consumers are unaffected by Pepsi’s PR crisis, with only 1% changing their buying habits after the event. 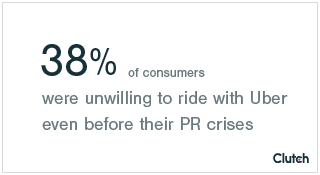 65% of consumers surveyed have never used Uber but are still aware of Uber’s PR crises. Having a solid PR strategy may be the most reliable solution to repairing public image in both the short and long term. Can Time Heal PR Wounds? 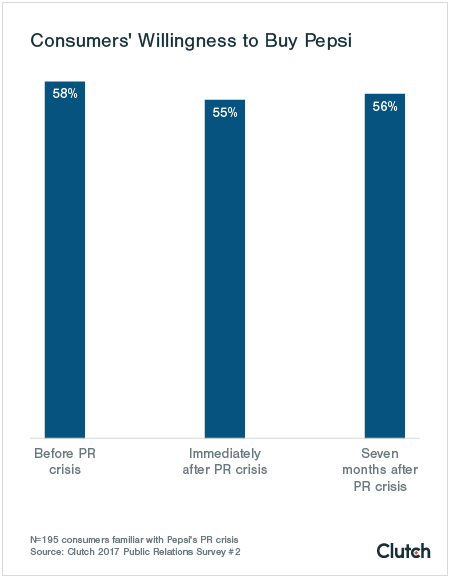 With the passage of time, brands that suffer PR crises can recover as long as they have a long-standing and loyal customer base. In our latest survey, we asked 500 consumers to indicate their willingness to purchase products or services from companies before, immediately after, and seven months after United Airlines, Pepsi, and Uber underwent a severe PR crisis. United Airlines’ PR crisis made consumers feel unsafe: 30% said that even today they would no longer buy United flights. In April 2017, United Airlines’ brand image was damaged after the release of video footage that depicted an airline official forcibly removing a passenger from a United flight. 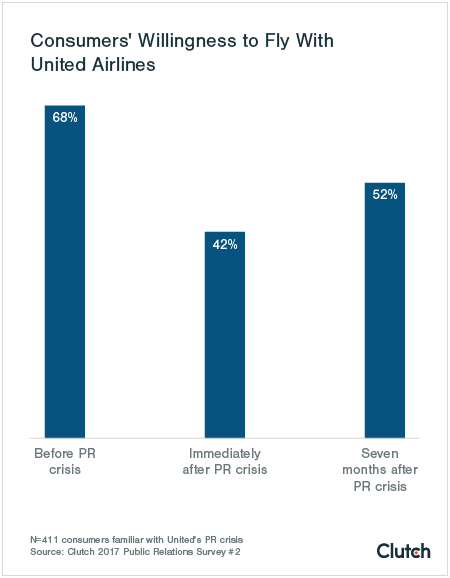 To measure the direct impact United’s PR crisis had on consumers, we asked survey respondents to indicate their willingness to purchase flights from United Airlines before the PR event, immediately after, and seven months later. Nearly 70% of consumers indicated they were willing to purchase flights from United Airlines before its PR crisis. This number drops to 42% of consumers who said they were still willing to buy flights from the brand immediately after witnessing the news event. When asked to give a reason for their change in behavior, 30% of consumers said they lost a sense of safety and trust in United Airlines immediately after its PR crisis and decided not to invest in the brand. According to Deborah Weinstein, President of Strategic Objectives, an award-winning public relations company in Canada, it’s not surprising that consumers decided not to fly with United Airlines since United’s PR blunder directly relates to consumers' health and safety. Events that threaten consumers’ physical safety can cause people to lose trust in a company immediately. 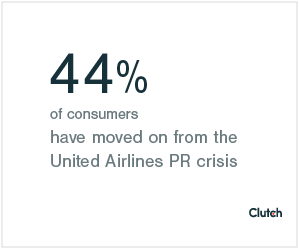 Today, seven months after United Airlines’ PR crisis, consumers’ perceptions of United recovered slightly, with 52% saying they are willing to buy flights from United Airlines. Of these consumers, 44% say that although they reacted negatively to United’s news coverage at first, they have since moved on. Jeremy Pepper, public relations and communications consultant at Communimatic, a public relations company in Los Angeles, attributes the rise of the internet and social media as one reason why consumers rebound from negative stories they hear in the news. News stories travel rapidly, allowing PR crises to solicit immediate reactions and be usurped by other stories that might be worse. More than anything, consumers care about their own wants and needs and will purchase products or services that satisfy those wants and needs, according to Weinstein. "If there are only United Airlines flights available, and there’s no other way to get to your destination, you’re still going to fly with United and hope for the best," says Weinstein. "Consumers are only looking to satisfy their needs – not the needs of the brand." Though time doesn’t necessarily heal all wounds, it allows for consumers to move past their immediate negative reactions, focusing instead on price, limited options, and accessibility of flights regardless of the airline. Consumers have not changed their behavior since Pepsi’s PR crisis due to Pepsi’s consumer following and the product Pepsi sells. Around the same time as United’s PR crisis, Pepsi underwent a PR blunder by issuing an insensitive commercial featuring Kendall Jenner. The marketing mistake sparked disapproval from consumers who disagreed with the commercial’s message. Replicating the process with United Airlines, we asked consumers to indicate their willingness to purchase Pepsi products before, immediately after, and seven months after the commercial aired. 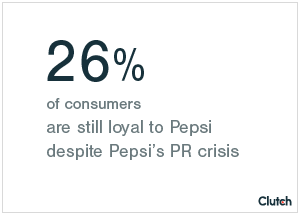 As time passed, consumers did not significantly change their behavior, with respondents’ willingness to purchase Pepsi only dropping from 56% to 55% immediately after Pepsi’s PR crisis. According to Kent Stones, CEO at Stones Insight, an insights company in Redondo Beach, California, the reason for the minimal change is because Pepsi, being a lifestyle product, has a minimal financial effect on consumers. In the long run, Pepsi’s products don’t have a significant impact on consumers as they go about their day-to-day lives. Of the 56% of survey respondents who said that they would be willing to buy Pepsi today, 26% said that they have simply always bought Pepsi and the news coverage didn’t bother them. The other 30% said that though the commercial bothered them at first, they have since moved on. Tim Collins, Principal at California-based public relations firm Grisdale Advisors and former Senior Vice President of Experiential Marketing at Wells Fargo, says the ability for brands to recover from PR crises depends on their pre-existing brand reputation. Pepsi didn’t experience a dramatic change in its consumer following because its customers are loyal, which allows Pepsi to move on from the PR crisis with ease. Uber faces the greatest threat to its brand reputation in the long term because it lacks a solid consumer following. Throughout 2017, Uber’s brand experienced multiple PR crises: The ousting of the CEO, allegations of corporate fraud, and multiple cases of sexual assault of both passengers and Uber employees. We asked consumers to indicate their willingness to ride with Uber before, immediately after, and seven months after Uber was featured negatively in the news. Consumers’ willingness to ride with Uber dropped from 60% to 47% immediately Uber was in the news for multiple misdemeanors. When asked to explain why their attitude toward Uber changed, 15% of consumers said they lost a sense of safety and trust in Uber and no longer want to invest in its services. The majority of consumers (38%), however, said that they were unwilling to ride with Uber even before allegations were uncovered in the news. This trend indicates a lack of consumer loyalty to Uber. Uber is a relatively young company that has not built a broad consumer base. Uber’s services are still limited to specific regions of the country and though many people are familiar with the brand, they might not have access to Uber depending on where they live or their financial status. Because Uber already lacks a strong consumer following, Uber’s many misdemeanors will have a larger impact on their reputation as a company. What companies do immediately after negative press coverage indicates their ability to manage their brand reputation in the long term. To define the difference between a short-term and long-term PR strategy, we looked to the experts to weigh in. 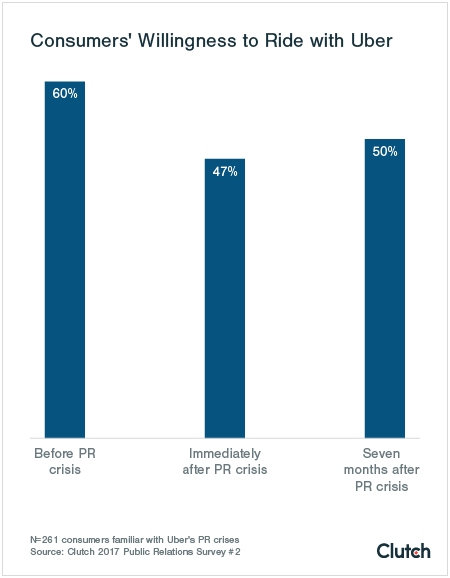 The most effective way for companies to salvage their consumer following after a PR crisis is to have a PR team in place to immediately take action. Pepsi maintained its consumer base because it acted on its marketing mistake right away, pulling the commercial and apologizing. In contrast, United Airlines waited several weeks to apologize, which consumers considered insincere and contrite. Uber faces the biggest threat to its brand reputation in the aftermath of it PR crises because of multiple instances of misbehavior and the lack of a short-term PR strategy. Long-term PR strategies deal with a brand’s overall reputation management. Long-term strategies aren’t likely to change and should align with the values and identity of a brand. In the end, brand reputation is the most important element of a company’s ability to maintain a strong and steady market presence. Often times, consumers will say one thing but do another. It’s up to companies to keep track of what people say and what they actually do to maintain the strength of their brand. Each of the companies we studied in our survey had PR crises tied to social causes. When it’s clear social norms are in place, people will respond in the way they think is socially acceptable. "The way United Airlines was positioned in the media following their PR crisis created a negative social bias against the brand," according to Collins. "Because of this, people will react negatively when asked about United because they think they need to. But, they may then go buy a ticket from United 15 minutes later." In response to the PR crises that companies undergo, it’s easy for people to say they will no longer purchase that company’s products or services. However, these same individuals may still buy from the brand. Pepper brings up price as the reason people act opposite to their intentions. Consumers certainly can react negatively to news events, but if prices are low and options are limited, those consumers will likely purchase a brand’s products or services anyway. Our survey also found that for each brand – United, Pepsi, and Uber – a large portion of the respondent pool had never purchased from those companies but were still familiar with their PR crises. 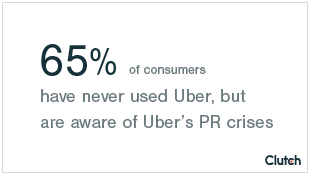 In fact, of consumers who were familiar with Uber’s negative press coverage, 65% had never used Uber before. Deborah Weinstein emphasizes that even if consumers aren’t purchasing from a brand, the company should pay attention to that audience. "Even people who have never used Uber may still have been considering giving it a try," says Weinstein. "But if all they’re hearing and seeing about Uber is negative, their potential for acceptance will decline." Consumers' perceptions of brands can impact their decision to purchase products or services down the line. Brand reputation is the most important element of any company’s ability to maintain a solid consumer base, especially in the aftermath of a PR crisis. Whether you’re a startup or a large corporation, having a solid public relations team on your side is imperative. Public relations strategies impact the long-term strength of brands. To make sure your company has the support it needs, check out our listing of Top PR Firms to find the best provider for your business. Clutch surveyed 500 consumers above the age of 18 and located in the United States. For each brand in the study, the screening criteria included only consumers who were familiar with the PR crises mentioned. Read detailed client reviews of public relations agencies to find the best provider for your business. Explore how Chick-fil-a, United, and Pepsi's PR teams tackled negative press.